The new site has been re-designed to meet the direct needs of the PGR Development Programme and we hope the website is more transparent and easier for all to use. The website structure closely follows the structure of the programme, with allocated sections for each programme component to outline the range of options for participants to fulfil each requirement, whilst promoting useful and relevant activities. We have also included a separate section to help students plan their own ‘Further Development’, development you will need to engage in to promote your research career and prepare for your future after your PhD, and to help you select appropriate activities for your Portfolio of Activity. This is the first part of a wider project to split the Graduate School website into the parts representing the activities of the two teams, PGR Development and the PGR Student Team. We have released this first part now to release information on the First Year Development Programme and the Careers Development options for the coming year. In the long-term, the front page of the graduate school website, www.liv.ac.uk/gradschool/ will remain as a recognised portal into the two separate web-sites. 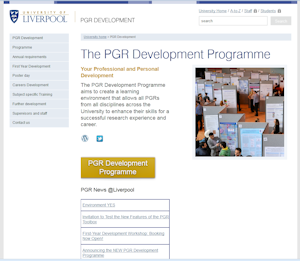 For the present the links to the PGR Development programme will re-route you to the appropriate pages in our new web-site.